Etwas fr�her als erwartet, denn noch 16 Tage bleiben bis zum Erscheinungstermin von Jace vs. Vraska, sind bereits die beiden Decks bekannt gegeben worden. Auch die Karten sind im Gatherer, dies bereits seit heute Nacht. Die Decks enthalten Reprints von Remand, Memory Lapse, Future Sight, Ohran Viper, Putrid Leech und Jace's Phantasm sowie noch ein paar andere nette Karten - neben den offensichtlichen Planeswalkern. Einige der Karten haben neue Artworks bekommen, wie beim �berfahren der Kartenlinks mit der Maus schon zu sehen ist. Body Double und Night's Whisper geh�ren auch dazu. Die Decks sehen lohnenswert aus und es k�nnte sich auszahlen, sich jetzt schon auf den 14. M�rz zu freuen, wenn die Decks in den Handel kommen. 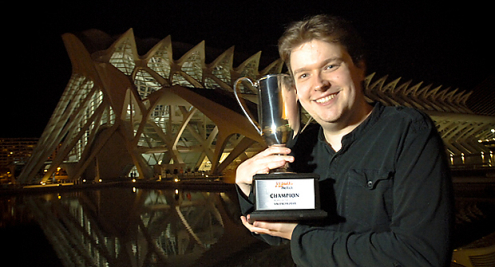 Neben der Text-Coverage gibt es auch eine Live-Video-Coverage auf WotC Webcast und Twitch. Diese startet am Freitag und Samstag um ca. 9.00 Uhr MEZ und am Sonntag um 10.00 Uhr MEZ. Die Kommentatoren sind BDM, Rich Hagon, Marshall Sutcliffe, Randy Buehler, Zac Hill und andere. F�r weitere Infos siehe das PT Born of the Gods Fact Sheet. Der Sieger ist Jonathon Habel mit G/R Monsters. Der Sieger ist Greg Smith mit Painted Stone. An beiden Tagen wird die Coverage von einer Live-Video-Coverage mit Patrick Sullivan & Cedric Phillips begleitet. Diese beginnt am Samstag um ca. 17.30 Uhr MEZ. 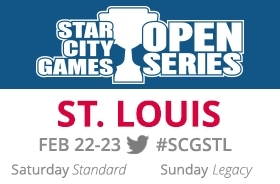 F�r weitere Infos siehe das SCG OS St. Louis 2014 Fact Sheet. Alex Lavoie Wins MDSS Halifax Again! [+]Alex Lavoie successfully defended his MDSS Halifax Cham […]The post Alex Lavoie Wins MDSS Halifax Again! appeared first on ManaDeprived.com. Is there any chance that we will see new card types (ie Planeswalker, Enchantment, Land) before the end of the seven year plan? I find it interesting that the card Damnation is a single word named card. I thought singled named cards for things you will want to reuse often? Yet, we have only seen damnation printed once? How does increasing the number of uncommons in a set (and thus decreasing the frequency of their occurrence in any given draft pod or sealed pool) make limited play better? I love games and I want to make games. Do you have any advice? Does recording your podcast help to get you in a magic frame of mind or are you just always thinking about magic? Would you sign a real or fake banana? Here's a question for the 'marks: do you think Maro should change his tumblr blog background or style to something else? I loved the PT top 8 coverage. I hope the response was positive enough that it will be the standard going forward. Does NWO have anything to say about land destruction? Was Theros block inspired by Greek mythology? Or did Greek mythology originate from a box of Theros which somehow ended up in ancient Greece? Why are all of the mechanics in Born of the Gods creature related? Inspired, heroic, tribute. M15 has 269 cards while most core sets had 249 was this done purposely to make up for cards missed in M14? When will the spoilers for JOU start? What Mel Brooks film is your favourite? It's my birthday! Could I get some trivia about Verdant Force? To the not so well versed of us in game design, can you explain the subtle differences between research, design and development? And even other departments involved in making cards if any. Why has provoke never been revisited? As a curiosity, as a newer Commander player, what about the format's political nature turns you off to it? Is it the fact that it may result in lack of fun for some players? I just found my MTG shoes I got autographed by you at Worlds 2011. Thanks again! What would you say is the strangest thing you've been asked to sign? Could red get temporary discard effects, in the form of "flickering" an opponent's hand? It feels right flavorfully to me, like red is throwing dirt in your eyes to throw you off temporarily. So, blue's philosophy is similar to black's in that it cares more about itself than others? It just has knowledge where black has power? Will we be seeing 'Rocket Launcher' making a comeback anytime soon ? Judging by some of the new flavour text in the soon-to-be-released Jace vs Vraska Duel Deck, the two planeswalkers are on a first-name basis. Any comment? Commandercast Season 12 Episode 7 - Mail Bag Day!!! Joy of Cubing # 21 - What Are You At? "Welcome to the world of Pok�mon!" So I went to Wilton Manors with Lionel tonight. I wonder how long this feeling of dread is going to stick around. Now, when you say putting your cards into other people's graveyards is off limits, is it also off-limits to cards that won't be legal in legacy or vintage? If I cast Teferi in response to any instant or flash creature, does he effectively counter that spell? If a card loses an ability until end of turn will it use the normal "loses [effect] until end of turn" or use the Archetype cycle's templating? Is setting the number of counters of a given type on a permanent a 'thing'? Like, "The number of charge counters on target artifact becomes four." I thought Archon were supposed to be faceless? What happened with Ornitharch? I'm not sure I understand the 1/1/2014 ruling on Daxos of Meletis. Can you clarify it? Why does ajani say "up to one creature" instead of you may put a +1/+1 counter on a creature? Am I stupid for thinking All Suns' Dawn's template is ugly and doesn't make sense? Do you consider another players card being in another players graveyard off the table? Or is it slightly plausible as its a publicly view able zone? I thought that there was no such thing as 'snow mana', only mana produced by lands with the Snow supertype. Or is it just that there's no functional difference? So now thanks to you, I think of all milled creatures as being buried alive. Are you particularly fond of Geoducks? When it comes to misidentifying French surrealists, you're Duchamp. "Place target battlefield with hexproof an opponent controls on the stack." Does it work within the rules? Could they be modified to allow it or would development just refuse? Why didn't you make "snow mana" a thing? It feels weird that mana made by Winter's Night can't be used to pay the costs of Snow mana symbols. Would their be any major rules problem with a land with tap: Each player add one mana of any colour to their mana pool? Since I'm doomed, tell my wife I said...hello. Gaming - D20 Stuff Random D20 images� - n3rd life�! Has someone drawn Tron Planeswalkers? Confessions of a Johnny: All The Single Faeries! BREW BOX: What's in the Box! aclovin: March 3rd is Festivale this year! "Once I dreamt of death, but now it dreams of me - And only rats and rotting flesh can hear my silent..."
"Plate mail, the skin of the chest, the rib cage, the heart?all useless against the mage who can..."
"Temporary discard" a part of red's future color pie? Knowledge Pool: How to Spot ?EDH Fodder? Dime a Dozen #40: Finish Him! How to properly use Zealous Persecution to avoid death by Deceiver Exarchs.